I have a client who has requested solid wood doors with the profile shown in the attached sketch. The detail is taken from a section showing the drawer fronts and the face frame. Originally the doors & fronts were to be MDF with a paint finish. This seemed a pretty simple CNC project. Now it has been switched to a solid wood door with a natural finish & I am unsure how to create this profile on a stable solid wood door. The largest door size I have is 17" x 44"
Are the doors mitered or cope and stick? If you went with mitered doors you could run the frame stock through a molder to achieve that profile. Company: Joe Coholic Custom Furniture Ltd.
You will have to do a mitred frame with the bead profile, and glue it to a veneered panel (solid will not allow the frame to be glued on all sides without blowing out the corners). A floating solid panel could also be done if necessary for a solid door, but you would have to have clearance and a vein line around the face - at the joint between panel and frame. Much better to use a veneered panel in this case. Is it in fact a 5-pc door or just a slab with a beaded edge. Can't tell from your drawing. I also can't tell from the drawing. If it is a veneered MDF door with a an applied molding, then it is simple. Miter the molding and fasten it to the face of the veneered door. Run the molding like any other through your (or someone else) molder. I don't know what affect, if any, the molding will have on the MDF flatness. If it is flat, I was thinking same approach as Larry, but 1/2" MDF at 17x44 might be a little iffy? What about hinges? Be VERY careful if you're boring for Euro hinges. Larry you are correct it is a flat slab with the molding. The only issue is that the client would prefer the whole thing to be solid wood. This seems pretty unstable to me. 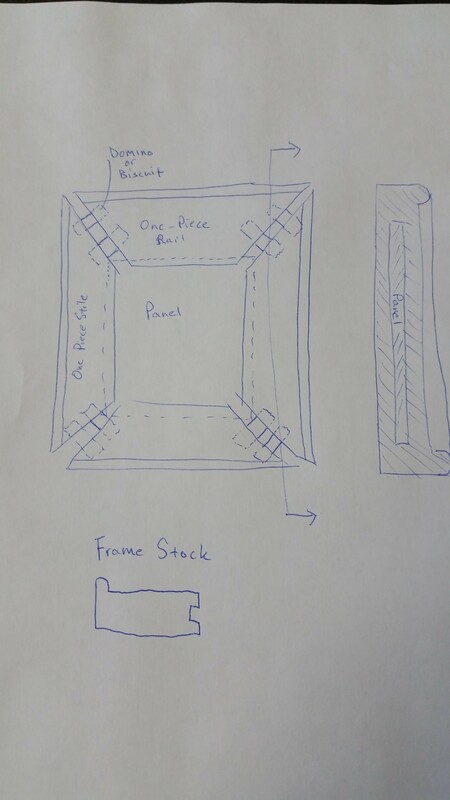 Andrew you mention a frame with a floating solid wood panel. Would you be able to explain or sketch that detail for me? I can't visualize how that would work. I guess I could increase the overall door to 7/8" thick to give a 5/8" slab which would reduce warping and allow Euro hinges. There is no way I would do solid wood @ the size of cabinet doors other than frame & panel. That is doable. Easiest with a mitered frame. If you lack the technology to do it, sub it out to someone that does. Many people lack the knowledge/understanding of how wood reacts to moisture. Most have already decided they know what is best in spite of reality. Thanks for taking the time to sketch that out for me Josh. That is how I thought the floating panel may work. The issue is that it will add an extra step down which the client does not want. Larry thanks for the advice on not using a solid panel for this. I will admit this is not my strong suit and would rather defer to people with more experience with solid wood doors. I think I will steer the client away from this profile if they want a wood finish. I am comfortable with the applied moulding on an veneered MDF core but aesthetically I don't like it. Explain to the client that there is a reason he/she has never seen this particular design in wood before - it is not done for a reason, not just because no one ever thought of it before. Frame and panel evolved from solid planks for a reason, also. Most folks have no idea that it is not just decorative. They sometimes come up with these ideas thinking that it will save them money, or to avoid the needless profit we are trying to build in. Just do a real beaded faceframe, and be done with it. 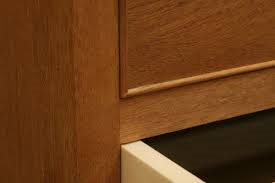 These designs that move the bead into the door and drawer panels have zero benefit to the artisan cabinetmaker. It's just a production work around. You must have read my mind. I just finished a lengthy email to my client expressing my concerns and suggesting we use a beaded face frame with shaker doors. I think this will be the best solution. Thanks for everyone's help, definitely assisted me in making the right decision. What I was referring to - a full thickness panel (solid) with a solid frame. You still have the vein line/ clearance to deal with in the appearance but with solids, of course the clearance is necessary. With a veneered panel not necessary. Your drawing seems to show a ¼" insert or use ½" solid wood as Andrew shows but move the rabbit back into the frame. If you don't have a supplier for specialized large sheet ½" solid wood or the technology, sub it out to Walzcraft; or use veneer. While I agree that putting this bead on/around a solid panel is not a good idea, I'm not sure your customer is crazy to request this detail or that it's never done. A bead like this (typically 1/8" - 1/4") mitered around a flat panel was very common in Federal-era furniture and was referred to as (no snickering, please!) a 'cockbead'. I think it can be quite snazzy looking when used appropriately. Even back in the day it was put around a stable veneered panel, though. When I have done them I've done them like an edgeband that stands proud of the panel face. Here is a picture I snagged off of the interwebs from the website of the Philadelphia Furniture Workshop. John Costin's bead appliqué is indeed a fine product but it tends to be labor intensive to make and subject to fitting difficulties, while one step up in manufacture might be the used of the beaded rail and stile producty available from Kreg making the bead an integral part of the rail and the stile profiles in a single piece of material. Steve, that would be similar but not identical to a cockbead. A cockbead is usually tight to the panel and a reveal is left between it and the next closest, er, member (such as stiles and rails). It's a different look. John Costin's mention of Federalist style cockbead only hints at the reasons it was done. It was an early method of disguising a five ply drawer front and a great method of showing the skills of the shop that could produce it. It was never applied until after all the close fitting of drawers was complete. Doing things to set a shop apart from the crowd is an old - and effective - method of self promotion - marketing. This is often forgotten in an age that places economy and efficiency above all else. Rant over.